Space artist Mark Maxwell: "We're on a spaceship right now"
Space artist Mark Maxwell was kind enough to take a couple questions from Jeffrey Manber while both were in Lexington recently to visit Kentucky Space. Answering the question about the purpose of space art, Mark said that people often forget that we're on a spacecraft now traveling at thousands of miles per hour, it's just that "we forget to look up." And replying to Jeffrey's question about accuracy in his work, he points out that great space art must also make us feel something about the subject. 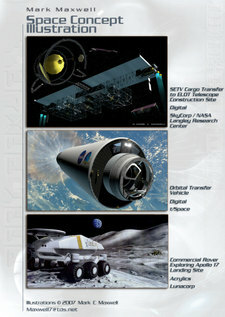 The image on the left is a page from Aeromancy.us, Mark's web site and is used with permission.